for heating and / or cooling for the production of sanitary hot water. while living in an apartment building. for thermal energy metering, distinguishing consumption volunteers energy of individual units from all other consumption. whilst safeguarding the quality of life. In buildings with a “horizontal distribution” central heating (most recent typology) the direct metering is used. This is feasable only in cases where there is a single point of access to the system that serves the apartment in which you want to “measure” the energy used. Therefore installation of heat meter is necessary, at the departure point of the distribution thermal system to each housing unit, that measures the thermal energy drawn voluntarily from the central heat plant, through the organs of thermoregulation. The instrumentation allows to charge each user only what is actually consumed. The instrumentation allows to charge each user only what is actually consumed. In buildings with a “vertical distribution” central heating, the indirect metering is used. The indirect metering of heat involves the use of devices or other splitter installed, together with the thermostatic valve or another thermostatic actuator, on all terminal elements (radiators, heated towel rails etc..) of heating system of each housing unit thus allowing to determine, in every room, the desired temperature. These devices allow an estimate of the thermal energy released in the environment from a single terminal, the sum will give an estimate of the heat supplied in the entire apartment. To obtain the energy savings heat metering and temperature control of energy delivery of individual terminals are required. Currently the laws in force in the field of new heating systems require the adoption of thermostatic valves that have at least two levels of temperature (one for daytime comfort and one for night one). EQUOBOX is the easy solution for smart metering proposed by Sinapsi. It is the tool aimed Energy Managers, Condominium Administrators, Facility Managers, Energy Utilities, which provide energy and resources measurement (metering) into buildings, allowing the allocation of running costs in compliance with UNI 10200. It is available in different solutions, BASIC, SMART, MASTER, MANAGER, CLOUD, based on the combination of LEVEL CONVERTER, RTU, REPEATER, CPU devices. It has a modular and scalable architecture, and it is made up of a wide range of devices able to manage measurement data, communicating over the most known protocols available on the market, such as M-Bus, KNX, OMS, Modbus. Its modularity and flexibility make it compatible with the all kinds of installations. It is possible to set up the whole system in a few minutes. With just one button, the user can start the process of scanning the network for research and recognition of the devices in the field. It ensures compatibility with most popular meters on the market. Its web interface allows to configure, in a simple and fast way, all the parameters of the system, while also allowing the intuitive consultation of data, notifications and alarms. It can be consulted by the user through the most popular consumer technologies: WEB browser and APP for Smartphone. Its structure is modulated in various scalable solutions to meet the different system needs, in accordance with the actual needs of the user, for the minimization of costs. Its wide range of devices allows metering for different sources of energy and resources, such as: electric energy, thermal and cooling energy, domestic hot and cold water, grey waters, gas, solid municipal waste. EQUOBOX enables the customers to monitor the energy efficiency by accurate and timely details of informations on consumptions, thus guaranteeing the data safety. By optimizing and reducing its his consumption, the user realizes significant economic and environmental savings. 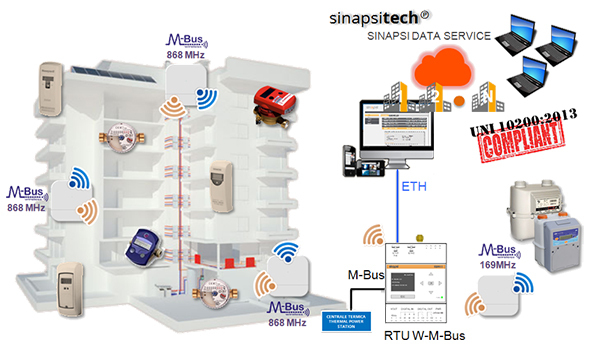 Discover all Sinapsi products and solutions for EQUOBOX smart metering system.